Happy 2014, friends! I hope everyone ushered in the new year as happily as I did. For me, NYE involved filet mignon, champagne, and a house of cards netflix binge with my husband-to-be and cat. Not gonna lie, staying in on new year's eve rather than partying was new for us, but I don't know if I ever want to go back. No crowds, no uncomfortable tights and heels, no makeup, no overpriced cocktails. Just comfy, quiet happiness. And it was wonderful. So now it's 2014. The first day of a brand new year... and I always love the start of a new year! I'm not typically one for official resolutions -- I try my hardest to make changes as I see fit throughout the year, not just at the beginning. But still, starting a new year always feels like an opportunity. A time to reflect on what went wrong and right during the past year, to look forward to what's to come, and to imagine the way you want things to unfold. For me, 2014 will be a big one: we're getting married! While Ryan and I have been together for a looonngg time and already live together, our wedding in May represents something new... an official promise of mutual support and love (forever!) and a joining of 2 families. We'll always remember 2014 as the year we became husband and wife. That's pretty big, huh? This year will also involve new directions in my academic/professional life (a dissertation! a new clinical experience! ), travel to new places, and hopefully a lot of new learning experiences. In general, for 2014, I hope for health, happiness, love, and personal growth. In fact, these are the things I hope 2014 brings to everyone I care about. So how about a recipe to usher in all of this positivity? I thought this granola recipe was the perfect one to share on the first day of this new year. If you want to start 2014 off on a healthy, clean, rejuvenating foot, this is a recipe you want! 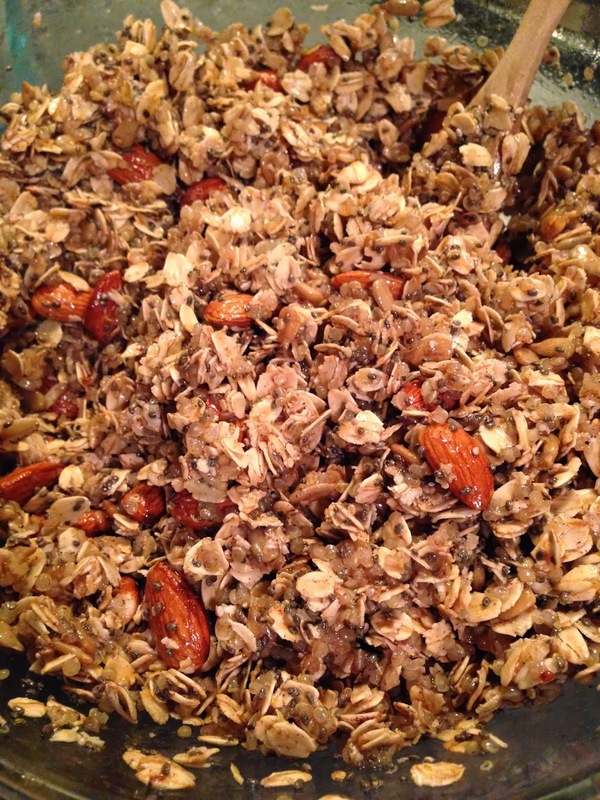 Oats, quinoa, chia seeds, sunflower seeds, almonds, dried cranberries. I mean, come on, could we BE any healthier here? Coconut oil and pure maple syrup bring it all together. Oohhh yeah! Just wait till the smell hits your nose as this bakes. Does quinoa in granola sound strange? It kind of does, right? But I promise you'll barely notice it's there. 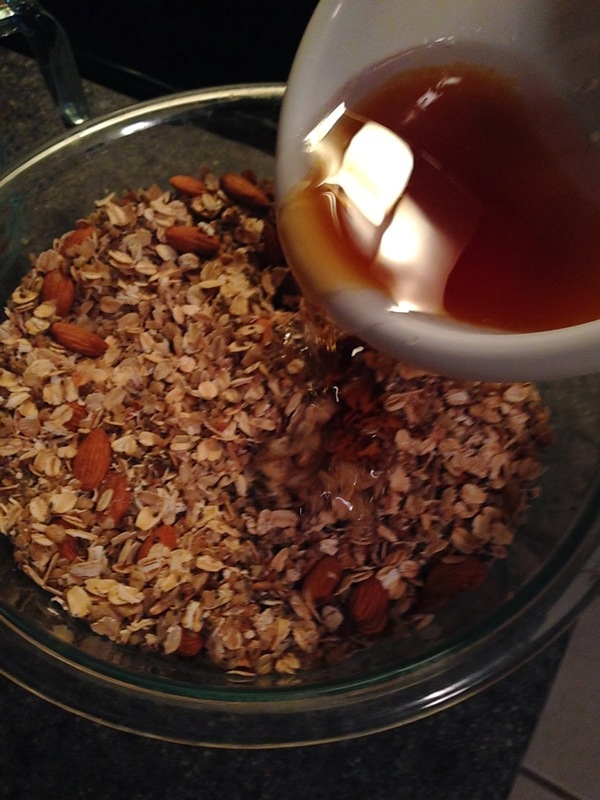 It adds a nice nuttiness and, along with the chia seeds, a big fiber boost to already-nutritious rolled oats. 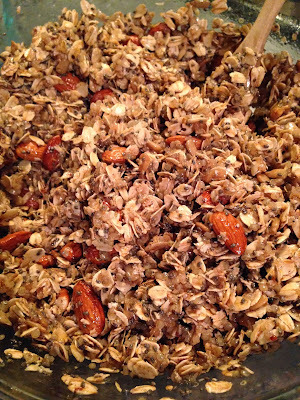 The base of this recipe is Gwyneth Paltrow's "favorite granola," which is already a BIG winner. My aunt first introduced me to goop's granola earlier this year and I have to give it to Gwynnie, it's definitely the best homemade granola I've ever had. Not too oily, slightly sweet but not overly so, and with a slight, interesting hint of Indian spice (I know it might sound weird, but just stay with me here). I made a few adaptations to the original recipe to make it even healthier and it's officially become my favorite breakfast and snack. If you care, it's also vegan and gluten-free. My favorite way to eat it? Sprinkled over plain Greek yogurt and drizzled with honey. The perfect post-workout breakfast! This recipe is completely adaptable. Leave out anything you don't like (well, besides the oats, that would be problematic) and add anything you do like (within reason). Add pumpkin seeds like Gwyneth did, add flax seeds instead of chia, toss in some dark chocolate chips or cocoa nibs (I like the way you think), use dried cherries instead of cranberries, replace the garam masala with nutmeg or cardamom, sprinkle in some hemp seeds instead of sunflower seeds. If you like it sweeter, you may want to add in a few tablespoons of agave nectar or stevia extract... as is, it needs a drizzle of honey to really get that sweetness (which is how I prefer it so that I can tailor the sweetness to the way I'm serving it/who I'm serving). What I'm saying is, this granola is your playground! 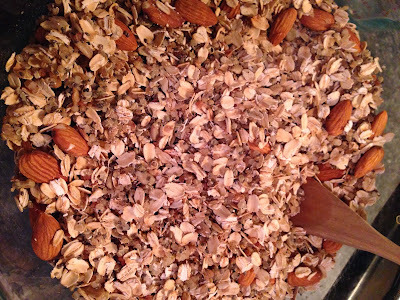 As is, each 1/2 cup serving of this granola has approximately 300 calories, 14 g fat, 7 g fiber, and 6.5 g protein (though I tend to eat more like 1/4 cup since I serve it over yogurt)... all from foods that your body LOVES. Cook half a cup of dry quinoa according to package directions. 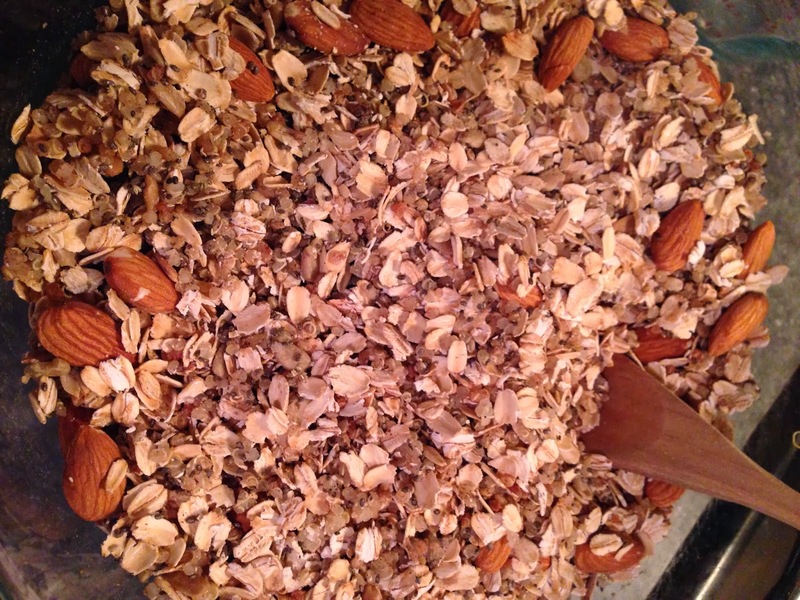 Then gather your dry ingredients: your cooked quinoa, 2.5 cups of old-fashioned rolled oats (not quick oats or steel cut oats), 1/2 cup whole almonds, 1/4 cup sunflower seeds, 1/4 cup chia seeds, and 1/2 cup dried cranberries. 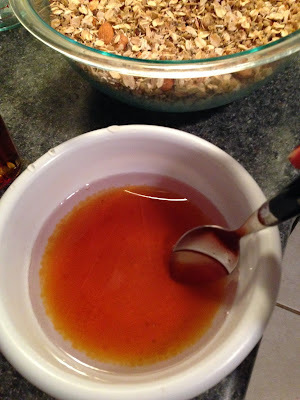 Also gather your wet ingredients: pure maple syrup (no exceptions!) and coconut oil. Mix all of your dry ingredients besides the dried cranberries in a large bowl along with 1/2 tsp fine sea salt, 1 tsp cinnamon, and 1/2 tsp garam masala until combined. 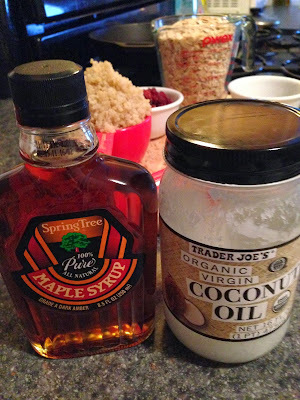 Melt 1/4 cup of coconut oil then mix with 1/2 cup of maple syrup. Pour over the dry ingredients and mix well until all combined. Spread out on a nonstick baking sheet sprayed lightly with coconut oil or cooking spray. You may want to use parchment paper for easy cleanup if you have it. Bake at 350 until slightly browned, about 25 to 35 minutes. Stir around every 5 or 10 minutes so that it browns evenly. The more crowded your pan, the longer it will take. Be careful not to burn the granola. Let cool completely. It should be crispy... if it's soft, you didn't cook it long enough! Once cool, mix in the dried cranberries (this would also be the time to add in dark chocolate if you're going that route). -Cook quinoa according to package directions. Let cool. 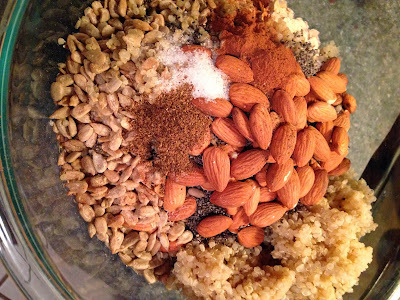 -In a large bowl, mix the cooked quinoa, oats, almonds, sunflower seeds, chia seeds, salt, cinnamon, and garam masala. -Melt the coconut oil, then mix with the maple syrup. -Pour the wet ingredients into the dry ingredients. Mix well until combined. -Spread out onto a baking sheet sprayed lightly with coconut oil or cooking spray. -Cook until lightly browned, 25-35 minutes. Stir around every 5 or 10 minutes as it cooks so that it browns evenly. The more crowded your pan, the longer it will take. Be careful not to burn the granola. -Let cool completely on the pan. Once cool, add in the dried cranberries. -Store in an airtight container or large ziploc. Delicious!!! 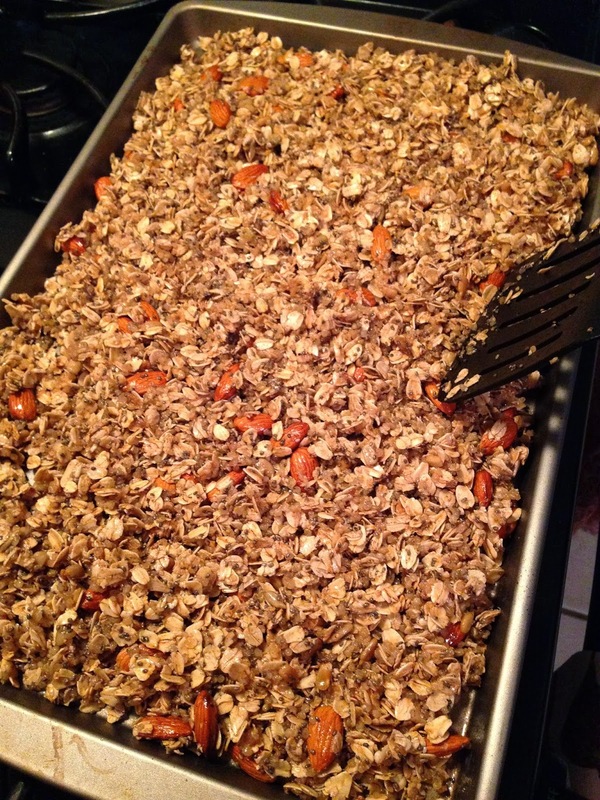 I can't keep granola in the house because it is legitimately my weakness...But I love making it and gifting it to people as a hostess gift or for the holidays because then I can munch a bit and then give it away. For the record I would have happily given up the champagne and tequila shots for filet mignon and a netflix marathon...though it was kind of nice to put some effort into my appearance since that only happens once a year! I hear you, getting dressed up is pretty fun every once in a while. I'm sure you looked stunning! Such a great breakfast or meal in general. I need more granola in my life! 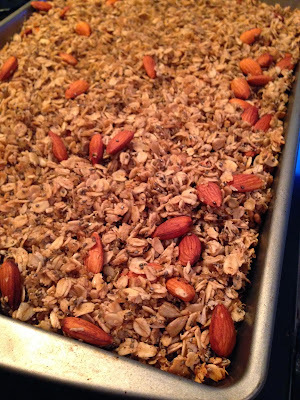 I was never huge on granola, but ever since I made this I'm eating it every day! with yogurt, in a bowl with almond milk, by the handful... I can't get enough! Yes! Staying in on NYE is really quite wonderful. It was our first time doing this, too. Although, we were at a B&B in Chincoteague. We got to bring in the new year in style: a fireplace, jacuzzi, comfy robes, and our pups. I highly recommend this way of celebrating :) I doubt, we too, will ever go back. Ahhhh, that sounds even nicer than our NYE :) we will have to try that! !